Replicas of the Pinta and Santa Maria, built for the 1992 quincentennial. Note the tiny topsail on Santa Maria. As everyone knows, Columbus had three ships on his first voyage, the Niña, the Pinta, and the Santa Maria. The flagship Santa Maria had the nickname La Gallega. It was a nao, which simply means “ship” in old Spanish; today, we might call such a ship a carrack. She was fat and slow, designed for hauling cargo, not for exploration. Some sources say that the Santa Maria was about 100 tons, meaning that it could carry 100 toneladas, which were large casks of wine. There has been much speculation about just how large such a ship would be; the best current thinking, by Carla Rahn Philips, puts the length of Santa Maria at 18 meters, keel length at 12 meters, beam 6 meters, and a depth of 3 meters from keel to deck. For a summary of the actual distances the fleet made every day of the voyage (in leagues), check out the First Voyage Log. To see some more photos, check out the Columbus Foundation page for the Niña replica. There are also replica ships that sail out of Corpus Christi, Texas; here&apos;s an article about them. Mariagalante, also known as Santa Maria, namesake of the original sunk on the first voyage. All of these were caravels except for the two naos, Mariagalante and Galician. 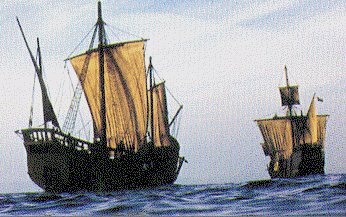 In February 1494, twelve caravels returned from Hispaniola to Spain, leaving the two naos and three caravels (Niña, Pinta, and San Juan). 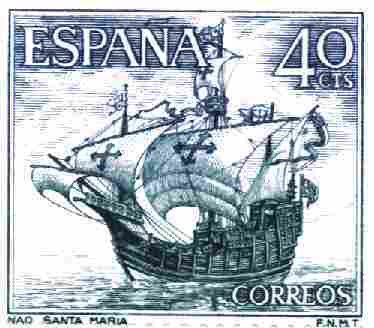 When Columbus returned to Spain he sailed in the Niña, along with another caravel, the Santa Cruz, also called the India, which was the first ship built by the Spanish in the New World. Little is known about the ships of Columbus&apos;s third voyage. Although we know Columbus started from Spain with six ships on his third voyage, we do not know the names of those ships. Upon arriving at the Canary Islands, Columbus sent three of the ships directly to Hispaniola, while he turned south to the Cape Verde Islands with the other three, before turning west across the Atlantic. The name of the ship that returned Columbus to Spain (in chains) is also unknown. All four ships were lost on the voyage. Gallega had to be abandoned in an estuary in Panama because of Indian attacks, on April 16, 1503. Vizcaina was leaking so badly that she was abandoned shortly thereafter, also along the Panama coast. The remaining two ships made it as far as Jamaica before shipworm and leaks made it impossible to continue. After waiting over a year for rescue, Columbus finally returned home in 1504, making his last crossing of the Atlantic as a passenger.